For other uses, see Cannon (disambiguation). A cannon (plural: cannon or cannons) is a type of gun classified as artillery that launches a projectile using propellant. In the past, gunpowder was the primary propellant before the invention of smokeless powder in the 19th century. Cannon vary in caliber, range, mobility, rate of fire, angle of fire, and firepower; different forms of cannon combine and balance these attributes in varying degrees, depending on their intended use on the battlefield. The word cannon is derived from several languages, in which the original definition can usually be translated as tube, cane, or reed. In the modern era, the term cannon has fallen into decline, replaced by guns or artillery if not a more specific term such as mortar or howitzer, except for high calibre automatic weapons firing bigger rounds than machine guns, called autocannons. The earliest known depiction of cannon appeared in Song dynasty China as early as the 12th century, however solid archaeological and documentary evidence of cannon do not appear until the 13th century. In 1288 Yuan dynasty troops are recorded to have used hand cannons in combat, and the earliest extant cannon bearing a date of production comes from the same period. By 1326 depictions of cannon had also appeared in Europe and almost immediately recorded usage of cannon began appearing. 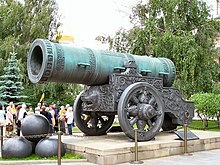 By the end of the 14th century cannon were widespread throughout Eurasia. Cannon were used primarily as anti-infantry weapons until around 1374 when cannon were recorded to have breached walls for the first time in Europe. Cannon featured prominently as siege weapons and ever larger pieces appeared. In 1464 a 16,000 kg (35273.962 lbs) cannon known as the Great Turkish Bombard was created in the Ottoman Empire. Cannon as field artillery became more important after 1453 with the introduction of limber, which greatly improved cannon maneuverability and mobility. European cannon reached their longer, lighter, more accurate, and more efficient "classic form" around 1480. This classic European cannon design stayed relatively consistent in form with minor changes until the 1750s. Cannon is derived from the Old Italian word cannone, meaning "large tube", which came from Latin canna, in turn originating from the Greek κάννα (kanna), "reed", and then generalised to mean any hollow tube-like object; cognate with Akkadian qanu(m) and Hebrew qāneh, "tube, reed". The word has been used to refer to a gun since 1326 in Italy, and 1418 in England. Both cannons and cannon are correct and in common usage, with one or the other having preference in different parts of the English-speaking world. Cannons is more common in North America and Australia, while cannon as plural is more common in the United Kingdom. Dazu Rock Carvings - a man holding a large hand cannon, with its flames and ball issuing forth, 1128. Discovered in 1980, Gansu, late Western Xia (1214-1227). The Western Xia Bronze Gun is 100 cm in length and weighs 108.5 kg. The cannon may have appeared as early as the 12th century in China, and was probably a parallel development or evolution of the fire-lance, a short ranged anti-personnel weapon combining a gunpowder-filled tube and a polearm of some sort. Co-viative projectiles such as iron scraps or porcelain shards were placed in fire lance barrels at some point, and eventually, the paper and bamboo materials of fire lance barrels were replaced by metal. The earliest known depiction of a cannon is a sculpture from the Dazu Rock Carvings in Sichuan dated to 1128, however the earliest archaeological samples and textual accounts do not appear until the 13th century. The primary extant specimens of cannon from the 13th century are the Wuwei Bronze Cannon dated to 1227, the Heilongjiang hand cannon dated to 1288, and the Xanadu Gun dated to 1298. However, only the Xanadu gun contains an inscription bearing a date of production, so it is considered the earliest confirmed extant cannon. The Xanadu Gun is 34.7 cm in length and weighs 6.2 kg. The other cannon are dated using contextual evidence. The Heilongjiang hand cannon is also often considered by some to be the oldest firearm since it was unearthed near the area where the History of Yuan reports a battle took place involving hand cannon. According to the History of Yuan, in 1288, a Jurchen commander by the name of Li Ting led troops armed with hand cannon into battle against the rebel prince Nayan. Chen Bingying argues there were no guns before 1259 while Dang Shoushan believes the Wuwei gun and other Western Xia era samples point to the appearance of guns by 1220, and Stephen Haw goes even further by stating that guns were developed as early as 1200. Sinologist Joseph Needham and renaissance siege expert Thomas Arnold provide a more conservative estimate of around 1280 for the appearance of the "true" cannon. Whether or not any of these are correct, it seems likely that the gun was born sometime during the 13th century. References to cannon proliferated throughout China in the following centuries. Cannon featured in literary pieces. In 1341 Xian Zhang wrote a poem called The Iron Cannon Affair describing a cannonball fired from an eruptor which could "pierce the heart or belly when striking a man or horse, and even transfix several persons at once." By the 1350s the cannon was used extensively in Chinese warfare. In 1358 the Ming army failed to take a city due to its garrisons' usage of cannon, however they themselves would use cannon, in the thousands, later on during the siege of Suzhou in 1366. The Korean kingdom of Joseon started producing gunpowder in 1374 and cannon by 1377. Cannon appeared in Đại Việt by 1390 at the latest. During the Ming dynasty cannon were used in riverine warfare at the Battle of Lake Poyang. One shipwreck in Shandong had a cannon dated to 1377 and an anchor dated to 1372. From the 13th to 15th centuries cannon-armed Chinese ships also travelled throughout Southeast Asia. The first of the western cannon to be introduced were breach-loaders in the early 16th century which the Chinese began producing themselves by 1523 and began improving later on. Japan did not acquire a cannon until 1510 when a monk brought one back from China, and did not produce any in appreciable numbers. During the 1593 Siege of Pyongyang, 40,000 Ming troops deployed a variety of cannon against Japanese troops. Despite their defensive advantage and the use of arquebus by Japanese soldiers, the Japanese were at a severe disadvantage due to their lack of cannon. Throughout the Japanese invasions of Korea (1592–98), the Ming-Joseon coalition used artillery widely in land and naval battles, including on the turtle ships of Yi Sun-sin. There are many merchants and military persons in the Chinese Empire. They have firearms, and the Chinese are very skillful in military affairs. They go into battle against the Yellow Mongols who fight with bows and arrows. Outside of China, the earliest texts to mention gunpowder are Roger Bacon's Opus Majus (1267) and Opus Tertium in what has been interpreted as references to firecrackers. In the early 20th century, a British artillery officer proposed that another work tentatively attributed to Bacon, Epistola de Secretis Operibus Artis et Naturae, et de Nullitate Magiae, also known as Opus Minor, dated to 1247, contained an encrypted formula for gunpowder hidden in the text. These claims have been disputed by science historians. In any case, the formula itself is not useful for firearms or even firecrackers, burning slowly and producing mostly smoke. There is a record of a gun in Europe dating to 1322 being discovered in the nineteenth century but the artifact has since been lost. The earliest known European depiction of a gun appeared in 1326 in a manuscript by Walter de Milemete, although not necessarily drawn by him, known as De Nobilitatibus, sapientii et prudentiis regum (Concerning the Majesty, Wisdom, and Prudence of Kings), which displays a gun with a large arrow emerging from it and its user lowering a long stick to ignite the gun through the touchole In the same year, another similar illustration showed a darker gun being set off by a group of knights, which also featured in another work of de Milemete's, De secretis secretorum Aristotelis. On 11 February of that same year, the Signoria of Florence appointed two officers to obtain canones de mettallo and ammunition for the town's defense. In the following year a document from the Turin area recorded a certain amount was paid "for the making of a certain instrument or device made by Friar Marcello for the projection of pellets of lead." A reference from 1331 describes an attack mounted by two Germanic knights on Cividale del Friuli, using gunpowder weapons of some sort. The 1320s seem to have been the takeoff point for guns in Europe according to most modern military historians. Scholars suggest that the lack of gunpowder weapons in a well-traveled Venetian's catalogue for a new crusade in 1321 implies that guns were unknown in Europe up until this point, further solidifying the 1320 mark, however more evidence in this area may be forthcoming in the future. The oldest extant cannon in Europe is a small bronze example unearthed in Loshult, Scania in southern Sweden. It dates from the early-mid 14th century, and is currently in the Swedish History Museum in Stockholm. Early cannon in Europe often shot arrows and were known by an assortment of names such as pot-de-fer, tonnoire, ribaldis, and büszenpyle. The ribaldis, which shot large arrows and simplistic grapeshot, were first mentioned in the English Privy Wardrobe accounts during preparations for the Battle of Crécy, between 1345 and 1346. The Florentine Giovanni Villani recounts their destructiveness, indicating that by the end of the battle, "the whole plain was covered by men struck down by arrows and cannon balls." 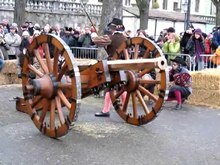 Similar cannon were also used at the Siege of Calais (1346–47), although it was not until the 1380s that the ribaudekin clearly became mounted on wheels. 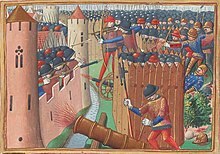 The battle of Crecy which pitted the English against the French in 1346 featured the early use of cannon which helped the long-bowmen repulse a large force of Genoese crossbowmen deployed by the French. The English originally intended to use the cannon against cavalry sent to attack their archers, thinking that the loud noises produced by their cannon would panic the advancing horses along with killing the knights atop them. Early cannon could also be used for more than simply killing men and scaring horses. English cannon were used defensively during the siege of the castle Breteuil to launch fire onto an advancing belfry. In this way cannon could be used to burn down siege equipment before it reached the fortifications. The use of cannon to shoot fire could also be used offensively as another battle involved the setting of a castle ablaze with similar methods. The particular incendiary used in these cannon was most likely a gunpowder mixture. This is one area where early Chinese and European cannon share a similarity as both were used to shoot fire as a possible use. Another aspect of early European cannon is that they were rather small, dwarfed by the bombards which would come later. In fact, it is possible that the cannon used at Crecy were capable of being moved rather quickly as there is an anonymous chronicle that notes the guns being used to attack the French camp, indicating that they would have been mobile enough press the attack. These smaller cannon would eventually give way to larger, wall breaching guns by the end of the 1300s. Malik E Maidan, a 16th-century cannon, was effectively utilised by the Deccan sultanates, and was the largest cannon operated during the Battle of Talikota. Solid documentary evidence of cannon appeared in the middle east around the 1360s, however some historians consider the arrival of the cannon there to be far earlier. According to historian Ahmad Y. al-Hassan, during the Battle of Ain Jalut in 1260, the Mamluks used cannon against the Mongols. He claims that this was "the first cannon in history" and used a gunpowder formula almost identical to the ideal composition for explosive gunpowder. He also argues that this was not known in China or Europe until much later. Hassan further claims that the earliest textual evidence of cannon is from the middle east, based on earlier originals which report hand-held cannon being used by the Mamluks at the Battle of Ain Jalut in 1260. However Hassan's claims have been refuted by other historians such as David Ayalon, Iqtidar Alam Khan, Joseph Needham, Tonio Andrade, and Gabor Ágoston. Khan argues that it was the Mongols who introduced gunpowder to the Islamic world, and believes cannon only reached Mamluk Egypt in the 1370s. According to Needham, the term midfa, dated to textual sources from 1342 to 1352, did not refer to true hand-guns or bombards, and contemporary accounts of a metal-barrel cannon in the Islamic world do not occur until 1365 Similarly, Andrade dates the textual appearance of cannon in middle eastern sources to the 1360s. Gabor Ágoston and David Ayalon believe the Mamluks had certainly used siege cannon by the 1360s, but earlier uses of cannon in the Islamic World are vague with a possible appearance in the Emirate of Granada by the 1320s and 1330s, however evidence is inconclusive. Ibn Khaldun reported the use of cannon as siege machines by the Marinid sultan Abu Yaqub Yusuf at the siege of Sijilmasa in 1274. The passage by Ibn Khaldun on the Marinid Siege of Sijilmassa in 1274 occurs as follows: "[ The Sultan] installed siege engines … and gunpowder engines …, which project small balls of iron. These balls are ejected from a chamber … placed in front of a kindling fire of gunpowder; this happens by a strange property which attributes all actions to the power of the Creator." However the source is not contemporary and was written a century later around 1382. Its interpretation has been rejected as anachronistic by most historians, who urge caution regarding claims of Islamic firearms use in the 1204–1324 period as late medieval Arabic texts used the same word for gunpowder, naft, as they did for an earlier incendiary, naphtha. Ágoston and Peter Purton note that in the 1204–1324 period, late medieval Arabic texts used the same word for gunpowder, naft, that they used for an earlier incendiary naphtha. Needham believes Ibn Khaldun was speaking of fire lances rather than hand cannon. References to early use of firearms in Islamdom (1204, 1248, 1274, 1258–60, 1303 and 1324) must be taken with caution since terminology used for gunpowder and firearms in late medieval Arabic sources is confused. Furthermore, most of these testimonies are given by later chroniclers of the fifteenth century whose use of terminology may have reflected their own time rather than that of the events they were writing about. The Ottoman Empire in particular made good use of cannon as siege artillery. Sixty-eight super-sized bombards were used by Mehmed the Conqueror to capture Constantinople in 1453. 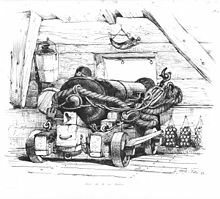 Jim Bradbury argues that Urban, a Hungarian cannon engineer, introduced this cannon from Central Europe to the Ottoman realm; according to Paul Hammer, however, it could have been introduced from other Islamic countries which had earlier used cannon. These cannon could fire heavy stone balls a mile, and the sound of their blast could reportedly be heard from a distance of 10 miles (16 km). Shkodëran historian Marin Barleti discusses Turkish bombards at length in his book De obsidione Scodrensi (1504), describing the 1478–79 siege of Shkodra in which eleven bombards and two mortars were employed. The Ottomans also used cannon to sink ships which attempted to prevent them from crossing the Bosporus strait. Ottoman cannon also proved effective at stopping crusaders at Varna in 1444 and Kosovo in 1448 despite the presence of European cannon in the former case. The similar Dardanelles Guns (for the location) were created by Munir Ali in 1464 and were still in use during the Anglo-Turkish War (1807–09). These were cast in bronze into two parts, the chase (the barrel) and the breech, which combined weighed 18.4 tonnes. The two parts were screwed together using levers to facilitate moving it. 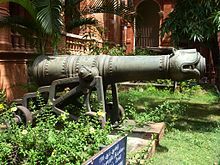 Fathullah Shirazi, a Persian inhabitant of India who worked for Akbar in the Mughal Empire, developed a volley gun in the 16th century. Large cannon in Bidar Fort. While there is evidence of cannon in Iran as early as 1405 they were not widespread. This changed following the increased use of firearms by Shah Isma il I, and the Iranian army used 500 cannon by the 1620s, probably captured from the Ottomans or acquired by allies in Europe. By 1443 Iranians were also making some of their own cannon, as Mir Khawand wrote of a 1200kg metal piece being made by an Iranian rekhtagar which was most likely a cannon. Due to the difficulties of transporting cannon in mountainous terrain, their use was less common compared to their use in Europe. Documentary evidence of cannon in Russia does not appear until 1382 and they were used only in sieges, often by the defenders. It was not until 1475 when Ivan III established the first Russian cannon foundry in Moscow that they began to produce cannon natively. 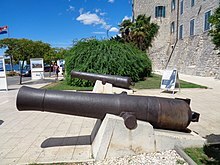 Later on large cannon were known as bombards, ranging from three to five feet in length and were used by Dubrovnik and Kotor in defence during the later 14th century. The first bombards were made of iron, but bronze became more prevalent as it was recognized as more stable and capable of propelling stones weighing as much as 45 kilograms (99 lb). Around the same period, the Byzantine Empire began to accumulate its own cannon to face the Ottoman Empire, starting with medium-sized cannon 3 feet (0.91 m) long and of 10 in calibre. The earliest reliable recorded use of artillery in the region was against the Ottoman siege of Constantinople in 1396, forcing the Ottomans to withdraw. The Ottomans acquired their own cannon and laid siege to the Byzantine capital again in 1422. By 1453, the Ottomans used 68 Hungarian-made cannon for the 55-day bombardment of the walls of Constantinople, "hurling the pieces everywhere and killing those who happened to be nearby." The largest of their cannon was the Great Turkish Bombard, which required an operating crew of 200 men and 70 oxen, and 10,000 men to transport it. Gunpowder made the formerly devastating Greek fire obsolete, and with the final fall of Constantinople—which was protected by what were once the strongest walls in Europe—on 29 May 1453, "it was the end of an era in more ways than one." While previous smaller guns could burn down structures with fire, larger cannon were so effective that engineers were forced to develop stronger castle walls to prevent their keeps from falling. This isn't to say that cannon were only used to batter down walls as fortifications began using cannon as defensive instruments such as an example in India where the fort of Raicher had gun ports built into its walls to accommodate the use of defensive cannon. In Art of War Niccolò Machiavelli opined that field artillery forced an army to take up a defensive posture and this opposed a more ideal offensive stance. Machiavelli's concerns can be seen in the criticisms of Portuguese mortars being used in India during the sixteenth century as lack of mobility was one of the key problems with the design. In Russia the early cannon were again placed in forts as a defensive tool. Cannon were also difficult to move around in certain types of terrain with mountains providing a great obstacle for them, for these reasons offensives conducted with cannon would be difficult to pull off in places such as Iran. By the 16th century, cannon were made in a great variety of lengths and bore diameters, but the general rule was that the longer the barrel, the longer the range. Some cannon made during this time had barrels exceeding 10 ft (3.0 m) in length, and could weigh up to 20,000 pounds (9,100 kg). Consequently, large amounts of gunpowder were needed, to allow them to fire stone balls several hundred yards. By mid-century, European monarchs began to classify cannon to reduce the confusion. Henry II of France opted for six sizes of cannon, but others settled for more; the Spanish used twelve sizes, and the English sixteen. Better powder had been developed by this time as well. Instead of the finely ground powder used by the first bombards, powder was replaced by a "corned" variety of coarse grains. This coarse powder had pockets of air between grains, allowing fire to travel through and ignite the entire charge quickly and uniformly. The end of the Middle Ages saw the construction of larger, more powerful cannon, as well their spread throughout the world. As they were not effective at breaching the newer fortifications resulting from the development of cannon, siege engines—such as siege towers and trebuchets—became less widely used. However, wooden "battery-towers" took on a similar role as siege towers in the gunpowder age—such as that used at Siege of Kazan in 1552, which could hold ten large-calibre cannon, in addition to 50 lighter pieces. Another notable effect of cannon on warfare during this period was the change in conventional fortifications. Niccolò Machiavelli wrote, "There is no wall, whatever its thickness that artillery will not destroy in only a few days." Although castles were not immediately made obsolete by cannon, their use and importance on the battlefield rapidly declined. Instead of majestic towers and merlons, the walls of new fortresses were thick, angled, and sloped, while towers became low and stout; increasing use was also made of earth and brick in breastworks and redoubts. These new defences became known as bastion forts, after their characteristic shape which attempted to force any advance towards it directly into the firing line of the guns. A few of these featured cannon batteries, such as the House of Tudor's Device Forts, in England. Bastion forts soon replaced castles in Europe, and, eventually, those in the Americas, as well. By the end of the 15th century, several technological advancements made cannon more mobile. Wheeled gun carriages and trunnions became common, and the invention of the limber further facilitated transportation. As a result, field artillery became more viable, and began to see more widespread use, often alongside the larger cannon intended for sieges. Better gunpowder, cast-iron projectiles (replacing stone), and the standardisation of calibres meant that even relatively light cannon could be deadly. In The Art of War, Niccolò Machiavelli observed that "It is true that the arquebuses and the small artillery do much more harm than the heavy artillery." This was the case at the Battle of Flodden, in 1513: the English field guns outfired the Scottish siege artillery, firing two or three times as many rounds. Despite the increased maneuverability, however, cannon were still the slowest component of the army: a heavy English cannon required 23 horses to transport, while a culverin needed nine. Even with this many animals pulling, they still moved at a walking pace. Due to their relatively slow speed, and lack of organisation, and undeveloped tactics, the combination of pike and shot still dominated the battlefields of Europe. Innovations continued, notably the German invention of the mortar, a thick-walled, short-barrelled gun that blasted shot upward at a steep angle. Mortars were useful for sieges, as they could hit targets behind walls or other defences. This cannon found more use with the Dutch, who learnt to shoot bombs filled with powder from them. Setting the bomb fuse was a problem. "Single firing" was first used to ignite the fuse, where the bomb was placed with the fuse down against the cannon's propellant. This often resulted in the fuse being blown into the bomb, causing it to blow up as it left the mortar. Because of this, "double firing" was tried where the gunner lit the fuse and then the touch hole. This, however, required considerable skill and timing, and was especially dangerous if the gun misfired, leaving a lighted bomb in the barrel. Not until 1650 was it accidentally discovered that double-lighting was superfluous as the heat of firing would light the fuse. Gustavus Adolphus of Sweden emphasised the use of light cannon and mobility in his army, and created new formations and tactics that revolutionised artillery. 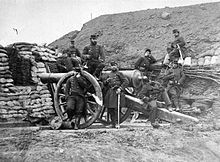 He discontinued using all 12 pounder—or heavier—cannon as field artillery, preferring, instead, to use cannon that could be handled by only a few men. One obsolete type of gun, the "leatheren" was replaced by 4 pounder and 9 pounder demi-culverins. These could be operated by three men, and pulled by only two horses. Adolphus's army was also the first to use a cartridge that contained both powder and shot which sped up reloading, increasing the rate of fire. Finally, against infantry he pioneered the use of canister shot – essentially a tin can filled with musket balls. Until then there was no more than one cannon for every thousand infantrymen on the battlefield but Gustavus Adolphus increased the number of cannon sixfold. Each regiment was assigned two pieces, though he often arranged then into batteries instead of distributing them piecemeal. He used these batteries to break his opponent's infantry line, while his cavalry would outflank their heavy guns. At the Battle of Breitenfeld, in 1631, Adolphus proved the effectiveness of the changes made to his army, by defeating Johann Tserclaes, Count of Tilly. Although severely outnumbered, the Swedes were able to fire between three and five times as many volleys of artillery, and their infantry's linear formations helped ensure they didn't lose any ground. Battered by cannon fire, and low on morale, Tilly's men broke ranks and fled. In England cannon were being used to besiege various fortified buildings during the English Civil War. Nathaniel Nye is recorded as testing a Birmingham cannon in 1643 and experimenting with a saker in 1645. From 1645 he was the master gunner to the Parliamentarian garrison at Evesham and in 1646 he successfully directed the artillery at the Siege of Worcester, detailing his experiences and in his 1647 book The Art of Gunnery. Believing that war was as much a science as an art, his explanations focused on triangulation, arithmetic, theoretical mathematics, and cartography as well as practical considerations such as the ideal specification for gunpowder or slow matches. His book acknowledged mathematicians such as Robert Recorde and Marcus Jordanus as well as earlier military writers on artillery such as Niccolò Fontana Tartaglia and Thomas (or Francis) Malthus (author of A Treatise on Artificial Fire-Works). Fort Bourtange, a bastion fort, was built with angles and sloped walls specifically to defend against cannon. Around this time also came the idea of aiming the cannon to hit a target. Gunners controlled the range of their cannon by measuring the angle of elevation, using a "gunner's quadrant." Cannon did not have sights, therefore, even with measuring tools, aiming was still largely guesswork. In the latter half of the 17th century, the French engineer Sébastien Le Prestre de Vauban introduced a more systematic and scientific approach to attacking gunpowder fortresses, in a time when many field commanders "were notorious dunces in siegecraft." Careful sapping forward, supported by enfilading ricochets, was a key feature of this system, and it even allowed Vauban to calculate the length of time a siege would take. He was also a prolific builder of bastion forts, and did much to popularize the idea of "depth in defence" in the face of cannon. These principles were followed into the mid-19th century, when changes in armaments necessitated greater depth defence than Vauban had provided for. It was only in the years prior to World War I that new works began to break radically away from his designs. The lower tier of 17th-century English ships of the line were usually equipped with demi-cannon, guns that fired a 32-pound (15 kg) solid shot, and could weigh up to 3,400 pounds (1,500 kg). Demi-cannon were capable of firing these heavy metal balls with such force that they could penetrate more than a metre of solid oak, from a distance of 90 m (300 ft), and could dismast even the largest ships at close range. Full cannon fired a 42-pound (19 kg) shot, but were discontinued by the 18th century, as they were too unwieldy. By the end of the 18th century, principles long adopted in Europe specified the characteristics of the Royal Navy's cannon, as well as the acceptable defects, and their severity. 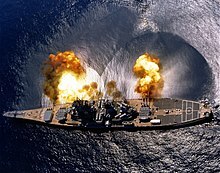 The United States Navy tested guns by measuring them, firing them two or three times—termed "proof by powder"—and using pressurized water to detect leaks. The carronade was adopted by the Royal Navy in 1779; the lower muzzle velocity of the round shot when fired from this cannon was intended to create more wooden splinters when hitting the structure of an enemy vessel, as they were believed to be more deadly than the ball by itself. The carronade was much shorter, and weighed between a third to a quarter of the equivalent long gun; for example, a 32-pounder carronade weighed less than a ton, compared with a 32-pounder long gun, which weighed over 3 tons. The guns were, therefore, easier to handle, and also required less than half as much gunpowder, allowing fewer men to crew them. Carronades were manufactured in the usual naval gun calibres, but were not counted in a ship of the line's rated number of guns. As a result, the classification of Royal Navy vessels in this period can be misleading, as they often carried more cannon than were listed. Cannon were crucial in Napoleon's rise to power, and continued to play an important role in his army in later years. During the French Revolution, the unpopularity of the Directory led to riots and rebellions. When over 25,000 royalists led by General Danican assaulted Paris, Paul Barras was appointed to defend the capital; outnumbered five to one and disorganised, the Republicans were desperate. When Napoleon arrived, he reorganised the defences but realised that without cannon the city could not be held. He ordered Joachim Murat to bring the guns from the Sablons artillery park; the Major and his cavalry fought their way to the recently captured cannon, and brought them back to Napoleon. When Danican's poorly trained men attacked, on 13 Vendémiaire, 1795 – 5 October 1795, in the calendar used in France at the time — Napoleon ordered his cannon to fire grapeshot into the mob, an act that became known as the "whiff of grapeshot". The slaughter effectively ended the threat to the new government, while, at the same time, made Bonaparte a famous—and popular—public figure. Among the first generals to recognise that artillery was not being used to its full potential, Napoleon often massed his cannon into batteries and introduced several changes into the French artillery, improving it significantly and making it among the finest in Europe. Such tactics were successfully used by the French, for example, at the Battle of Friedland, when sixty-six guns fired a total of 3,000 roundshot and 500 rounds of grapeshot, inflicting severe casualties to the Russian forces, whose losses numbered over 20,000 killed and wounded, in total. At the Battle of Waterloo—Napoleon's final battle—the French army had many more artillery pieces than either the British or Prussians. As the battlefield was muddy, recoil caused cannon to bury themselves into the ground after firing, resulting in slow rates of fire, as more effort was required to move them back into an adequate firing position; also, roundshot did not ricochet with as much force from the wet earth. Despite the drawbacks, sustained artillery fire proved deadly during the engagement, especially during the French cavalry attack. The British infantry, having formed infantry squares, took heavy losses from the French guns, while their own cannon fired at the cuirassiers and lancers, when they fell back to regroup. Eventually, the French ceased their assault, after taking heavy losses from the British cannon and musket fire. Illustration by William Simpson shows action in a British artillery battery during the Crimean War with cannon firing and being loaded, and men bringing in supplies. In the 1810s and 1820s, greater emphasis was placed on the accuracy of long-range gunfire, and less on the weight of a broadside. The carronade, although initially very successful and widely adopted, disappeared from the Royal Navy in the 1850s after the development of wrought-iron-jacketed steel cannon by William Armstrong and Joseph Whitworth. Nevertheless, carronades were used in the American Civil War. Western cannon during the 19th century became larger, more destructive, more accurate, and could fire at longer range. One example is the American 3-inch (76 mm) wrought-iron, muzzle-loading rifle, or Griffen gun (usually called the 3-inch Ordnance Rifle), used during the American Civil War, which had an effective range of over 1.1 mi (1.8 km). Another is the smoothbore 12-pounder Napoleon, which originated in France in 1853 and was widely used by both sides in the American Civil War. This cannon was renowned for its sturdiness, reliability, firepower, flexibility, relatively lightweight, and range of 1,700 m (5,600 ft). The practice of rifling—casting spiralling lines inside the cannon's barrel—was applied to artillery more frequently by 1855, as it gave cannon projectiles gyroscopic stability, which improved their accuracy. One of the earliest rifled cannon was the breech-loading Armstrong Gun—also invented by William Armstrong—which boasted significantly improved range, accuracy, and power than earlier weapons. The projectile fired from the Armstrong gun could reportedly pierce through a ship's side, and explode inside the enemy vessel, causing increased damage, and casualties. The British military adopted the Armstrong gun, and was impressed; the Duke of Cambridge even declared that it "could do everything but speak." Despite being significantly more advanced than its predecessors, the Armstrong gun was rejected soon after its integration, in favour of the muzzle-loading pieces that had been in use before. While both types of gun were effective against wooden ships, neither had the capability to pierce the armour of ironclads; due to reports of slight problems with the breeches of the Armstrong gun, and their higher cost, the older muzzle-loaders were selected to remain in service instead. Realising that iron was more difficult to pierce with breech-loaded cannon, Armstrong designed rifled muzzle-loading guns, which proved successful; The Times reported: "even the fondest believers in the invulnerability of our present ironclads were obliged to confess that against such artillery, at such ranges, their plates and sides were almost as penetrable as wooden ships." The superior cannon of the Western world brought them tremendous advantages in warfare. For example, in the First Opium War in China, during the 19th century, British battleships bombarded the coastal areas and fortifications from afar, safe from the reach of the Chinese cannon. Similarly, the shortest war in recorded history, the Anglo-Zanzibar War of 1896, was brought to a swift conclusion by shelling from British cruisers. The cynical attitude towards recruited infantry in the face of ever more powerful field artillery is the source of the term cannon fodder, first used by François-René de Chateaubriand, in 1814; however, the concept of regarding soldiers as nothing more than "food for powder" was mentioned by William Shakespeare as early as 1598, in Henry IV, Part 1. Cannon in the 20th and 21st centuries are usually divided into sub-categories and given separate names. Some of the most widely used types of modern cannon are howitzers, mortars, guns, and autocannon, although a few superguns—extremely large, custom-designed cannon—have also been constructed. Nuclear artillery was experimented with, but was abandoned as impractical. Modern artillery is used in a variety of roles, depending on its type. According to NATO, the general role of artillery is to provide fire support, which is defined as "the application of fire, coordinated with the manoeuvre of forces to destroy, neutralize, or suppress the enemy." When referring to cannon, the term gun is often used incorrectly. In military usage, a gun is a cannon with a high muzzle velocity and a flat trajectory, useful for hitting the sides of targets such as walls, as opposed to howitzers or mortars, which have lower muzzle velocities, and fire indirectly, lobbing shells up and over obstacles to hit the target from above. By the early 20th century, infantry weapons had become more powerful, forcing most artillery away from the front lines. Despite the change to indirect fire, cannon proved highly effective during World War I, directly or indirectly causing over 75% of casualties. The onset of trench warfare after the first few months of World War I greatly increased the demand for howitzers, as they were more suited at hitting targets in trenches. Furthermore, their shells carried more explosives than those of guns, and caused considerably less barrel wear. The German army had the advantage here as they began the war with many more howitzers than the French. World War I also saw the use of the Paris Gun, the longest-ranged gun ever fired. This 200 mm (8 in) calibre gun was used by the Germans against Paris and could hit targets more than 122 km (76 mi) away. The Second World War sparked new developments in cannon technology. Among them were sabot rounds, hollow-charge projectiles, and proximity fuses, all of which increased the effectiveness of cannon against specific target. The proximity fuse emerged on the battlefields of Europe in late December 1944. Used to great effect in anti-aircraft projectiles, proximity fuses were fielded in both the European and Pacific Theatres of Operations; they were particularly useful against V-1 flying bombs and kamikaze planes. Although widely used in naval warfare, and in anti-air guns, both the British and Americans feared unexploded proximity fuses would be reverse engineered leading to them limiting its use in continental battles. During the Battle of the Bulge, however, the fuses became known as the American artillery's "Christmas present" for the German army because of their effectiveness against German personnel in the open, when they frequently dispersed attacks. Anti-tank guns were also tremendously improved during the war: in 1939, the British used primarily 2 pounder and 6 pounder guns. By the end of the war, 17 pounders had proven much more effective against German tanks, and 32 pounders had entered development. Meanwhile, German tanks were continuously upgraded with better main guns, in addition to other improvements. For example, the Panzer III was originally designed with a 37 mm gun, but was mass-produced with a 50 mm cannon. To counter the threat of the Russian T-34s, another, more powerful 50 mm gun was introduced, only to give way to a larger 75 mm cannon, which was in a fixed mount as the StuG III, the most-produced German World War II armoured fighting vehicle of any type. Despite the improved guns, production of the Panzer III was ended in 1943, as the tank still could not match the T-34, and was replaced by the Panzer IV and Panther tanks. In 1944, the 8.8 cm KwK 43 and many variations, entered service with the Wehrmacht, and was used as both a tank main gun, and as the PaK 43 anti-tank gun. One of the most powerful guns to see service in World War II, it was capable of destroying any Allied tank at very long ranges. Despite being designed to fire at trajectories with a steep angle of descent, howitzers can be fired directly, as was done by the 11th Marine Regiment at the Battle of Chosin Reservoir, during the Korean War. Two field batteries fired directly upon a battalion of Chinese infantry; the Marines were forced to brace themselves against their howitzers, as they had no time to dig them in. The Chinese infantry took heavy casualties, and were forced to retreat. The tendency to create larger calibre cannon during the World Wars has reversed since. The United States Army, for example, sought a lighter, more versatile howitzer, to replace their ageing pieces. As it could be towed, the M198 was selected to be the successor to the World War II–era cannon used at the time, and entered service in 1979. Still in use today, the M198 is, in turn, being slowly replaced by the M777 Ultralightweight howitzer, which weighs nearly half as much and can be more easily moved. Although land-based artillery such as the M198 are powerful, long-ranged, and accurate, naval guns have not been neglected, despite being much smaller than in the past, and, in some cases, having been replaced by cruise missiles. However, the Zumwalt-class destroyer's planned armament includes the Advanced Gun System (AGS), a pair of 155 mm guns, which fire the Long Range Land-Attack Projectile. The warhead, which weighs 24 pounds (11 kg), has a circular error of probability of 50 m (160 ft), and will be mounted on a rocket, to increase the effective range to 100 nmi (190 km), further than that of the Paris Gun. The AGS's barrels will be water cooled, and will fire 10 rounds per minute, per gun. The combined firepower from both turrets will give a Zumwalt-class destroyer the firepower equivalent to 18 conventional M198 howitzers. The reason for the re-integration of cannon as a main armament in United States Navy ships is because satellite-guided munitions fired from a gun are less expensive than a cruise missile but have a similar guidance capability. Autocannons have an automatic firing mode, similar to that of a machine gun. They have mechanisms to automatically load their ammunition, and therefore have a higher rate of fire than artillery, often approaching, or, in the case of rotary autocannons, even surpassing the firing rate of a machine gun. While there is no minimum bore for autocannons, they are generally larger than machine guns, typically 20 mm or greater since World War II and are usually capable of using explosive ammunition even if it isn't always used. Machine guns in contrast are usually too small to use explosive ammunition. Most nations use rapid-fire cannon on light vehicles, replacing a more powerful, but heavier, tank gun. A typical autocannon is the 25 mm "Bushmaster" chain gun, mounted on the LAV-25 and M2 Bradley armoured vehicles. Autocannons may be capable of a very high rate of fire, but ammunition is heavy and bulky, limiting the amount carried. For this reason, both the 25 mm Bushmaster and the 30 mm RARDEN are deliberately designed with relatively low rates of fire. The typical rate of fire for a modern autocannon ranges from 90 to 1,800 rounds per minute. 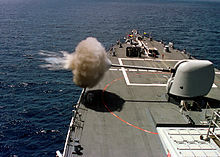 Systems with multiple barrels, such as a rotary autocannon, can have rates of fire of more than several thousand rounds per minute. The fastest of these is the GSh-6-23, which has a rate of fire of over 10,000 rounds per minute. Autocannons are often found in aircraft, where they replaced machine guns and as shipboard anti-aircraft weapons, as they provide greater destructive power than machine guns. The first documented installation of a cannon on an aircraft was on the Voisin Canon in 1911, displayed at the Paris Exposition that year. By World War I, all of the major powers were experimenting with aircraft mounted cannon; however their low rate of fire and great size and weight precluded any of them from being anything other than experimental. The most successful (or least unsuccessful) was the SPAD 12 Ca.1 with a single 37mm Puteaux mounted to fire between the cylinder banks and through the propeller boss of the aircraft's Hispano-Suiza 8C. The pilot (by necessity an ace) had to manually reload each round. The first autocannon were developed during World War I as anti-aircraft guns, and one of these – the Coventry Ordnance Works "COW 37 mm gun" was installed in an aircraft but the war ended before it could be given a field trial and never became standard equipment in a production aircraft. Later trials had it fixed at a steep angle upwards in both the Vickers Type 161 and the Westland C.O.W. Gun Fighter, an idea that would return later. Preceding the Vietnam War the high speeds aircraft were attaining led to a move to remove the cannon due to the mistaken belief that they would be useless in a dogfight, but combat experience during the Vietnam War showed conclusively that despite advances in missiles, there was still a need for them. Nearly all modern fighter aircraft are armed with an autocannon and they are also commonly found on ground-attack aircraft. One of the most powerful examples is the 30mm GAU-8/A Avenger Gatling-type rotary cannon, mounted exclusively on the Fairchild Republic A-10 Thunderbolt II. The Lockheed AC-130 gunship (a converted transport) can carry a 105mm howitzer as well as a variety of autocannons ranging up to 40mm. Both are used in the close air support role. Cannon in general have the form of a truncated cone with an internal cylindrical bore for holding an explosive charge and a projectile. The thickest, strongest, and closed part of the cone is located near the explosive charge. As any explosive charge will dissipate in all directions equally, the thickest portion of the cannon is useful for containing and directing this force. The backward motion of the cannon as its projectile leaves the bore is termed its recoil and the effectiveness of the cannon can be measured in terms of how much this response can be diminished, though obviously diminishing recoil through increasing the overall mass of the cannon means decreased mobility. Field artillery cannon in Europe and the Americas were initially made most often of bronze, though later forms were constructed of cast iron and eventually steel. :61 Bronze has several characteristics that made it preferable as a construction material: although it is relatively expensive, does not always alloy well, and can result in a final product that is "spongy about the bore",:61 bronze is more flexible than iron and therefore less prone to bursting when exposed to high pressure; cast iron cannon are less expensive and more durable generally than bronze and withstand being fired more times without deteriorating. However, cast iron cannon have a tendency to burst without having shown any previous weakness or wear, and this makes them more dangerous to operate. The older and more-stable forms of cannon were muzzle-loading as opposed to breech-loading— in order to be used they had to have their ordnance packed down the bore through the muzzle rather than inserted through the breech. The following terms refer to the components or aspects of a classical western cannon (c. 1850) as illustrated here. :66 In what follows, the words near, close, and behind will refer to those parts towards the thick, closed end of the piece, and far, front, in front of, and before to the thinner, open end. Bore: The hollow cylinder bored down the centre of the cannon, including the base of the bore or bottom of the bore, the nearest end of the bore into which the ordnance (wadding, shot, etc.) gets packed. The diameter of the bore represents the cannon's calibre. Chamber: The cylindrical, conical, or spherical recess at the nearest end of the bottom of the bore into which the gunpowder is packed. Vent: A thin tube on the near end of the cannon connecting the explosive charge inside with an ignition source outside and often filled with a length of fuse; always located near the breech. Sometimes called the fuse hole or the touch hole. On the top of the vent on the outside of the cannon is a flat circular space called the vent field where the charge is lit. If the cannon is bronze, it will often have a vent piece made of copper screwed into the length of the vent. The main body of a cannon consists of three basic extensions: the foremost and the longest is called the chase, the middle portion is the reinforce, and the closest and briefest portion is the cascabel or cascable. The neck: the narrowest part of the chase, always located near the foremost end of the piece. The swell of the muzzle refers to the slight swell in the diameter of the piece at the very end of the chase. It is often chamfered on the inside to make loading the cannon easier. In some guns, this element is replaced with a wide ring and is called a muzzle band. The face is the flat vertical plane at the foremost edge of the muzzle (and of the entire piece). The muzzle astragal and fillets are a series of three narrow rings running around the outside of the chase just behind the neck. Sometimes also collectively called the chase ring. The chase astragal and fillets: these are a second series of such rings located at the near end of the chase. The chase girdle: this is the brief length of the chase between the chase astragal and fillets and the reinforce. The trunnions are located at the foremost end of the reinforce just behind the reinforce ring. They consist of two cylinders perpendicular to the bore and below it which are used to mount the cannon on its carriage. The rimbases are short broad rings located at the union of the trunnions and the cannon which provide support to the carriage attachment. The reinforce band is only present if the cannon has two reinforces, and it divides the first reinforce from the second. The breech refers to the mass of solid metal behind the bottom of the bore extending to the base of the breech and including the base ring; it also generally refers to the end of the cannon opposite the muzzle, i.e., the location where the explosion of the gunpowder begins as opposed to the opening through which the pressurized gas escapes. The base ring forms a ring at the widest part of the entire cannon at the nearest end of the reinforce just before the cascabel. The fillet, the tiered disk connecting the neck of the cascabel to the base of the breech. The base of the breech is the metal disk that forms the most forward part of the cascabel and rests against the breech itself, right next to the base ring. To pack a muzzle-loading cannon, first gunpowder is poured down the bore. This is followed by a layer of wadding (often nothing more than paper), and then the cannonball itself. A certain amount of windage allows the ball to fit down the bore, though the greater the windage the less efficient the propulsion of the ball when the gunpowder is ignited. To fire the cannon, the fuse located in the vent is lit, quickly burning down to the gunpowder, which then explodes violently, propelling wadding and ball down the bore and out of the muzzle. A small portion of exploding gas also escapes through the vent, but this does not dramatically affect the total force exerted on the ball. Any large, smoothbore, muzzle-loading gun—used before the advent of breech-loading, rifled guns—may be referred to as a cannon, though once standardised names were assigned to different-sized cannon, the term specifically referred to a gun designed to fire a 42-pound (19 kg) shot, as distinct from a demi-cannon – 32 pounds (15 kg), culverin – 18 pounds (8.2 kg), or demi-culverin – 9 pounds (4.1 kg). Gun specifically refers to a type of cannon that fires projectiles at high speeds, and usually at relatively low angles; they have been used in warships, and as field artillery. The term cannon is also used for autocannon, a modern repeating weapon firing explosive projectiles. Cannon have been used extensively in fighter aircraft since World War II. In the 1770s, cannon operation worked as follows: each cannon would be manned by two gunners, six soldiers, and four officers of artillery. The right gunner was to prime the piece and load it with powder, and the left gunner would fetch the powder from the magazine and be ready to fire the cannon at the officer's command. On each side of the cannon, three soldiers stood, to ram and sponge the cannon, and hold the ladle. The second soldier on the left tasked with providing 50 bullets. Before loading, the cannon would be cleaned with a wet sponge to extinguish any smouldering material from the last shot. Fresh powder could be set off prematurely by lingering ignition sources. The powder was added, followed by wadding of paper or hay, and the ball was placed in and rammed down. After ramming, the cannon would be aimed with the elevation set using a quadrant and a plummet. At 45 degrees, the ball had the utmost range: about ten times the gun's level range. Any angle above a horizontal line was called random-shot. Wet sponges were used to cool the pieces every ten or twelve rounds. During the Napoleonic Wars, a British gun team consisted of five gunners to aim it, clean the bore with a damp sponge to quench any remaining embers before a fresh charge was introduced, and another to load the gun with a bag of powder and then the projectile. The fourth gunner pressed his thumb on the vent hole, to prevent a draught that might fan a flame. The charge loaded, the fourth would prick the bagged charge through the vent hole, and fill the vent with powder. On command, the fifth gunner would fire the piece with a slowmatch. When a cannon had to be abandoned such as in a retreat or surrender, the touch hole of the cannon would be plugged flush with an iron spike, disabling the cannon (at least until metal boring tools could be used to remove the plug). This was called "spiking the cannon". A gun was said to be honeycombed when the surface of the bore had cavities, or holes in it, caused either by corrosion or casting defects. Historically, logs or poles have been used as decoys to mislead the enemy as to the strength of an emplacement. The "Quaker Gun trick" was used by Colonel William Washington's Continental Army during the American Revolutionary War; in 1780, approximately 100 Loyalists surrendered to them, rather than face bombardment. During the American Civil War, Quaker guns were also used by the Confederates, to compensate for their shortage of artillery. The decoy cannon were painted black at the "muzzle", and positioned behind fortifications to delay Union attacks on those positions. On occasion, real gun carriages were used to complete the deception. Cannon sounds have sometimes been used in classical pieces with a military theme. One of the best known examples of such a piece is Pyotr Ilyich Tchaikovsky's 1812 Overture. The overture is to be performed using an artillery section together with the orchestra, resulting in noise levels high enough that musicians are required to wear ear protection. The cannon fire simulates Russian artillery bombardments of the Battle of Borodino, a critical battle in Napoleon's invasion of Russia, whose defeat the piece celebrates. When the overture was first performed, the cannon were fired by an electric current triggered by the conductor. However, the overture was not recorded with real cannon fire until Mercury Records and conductor Antal Doráti's 1958 recording of the Minnesota Orchestra. 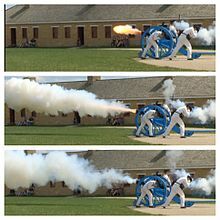 Cannon fire is also frequently used annually in presentations of the 1812 on the American Independence Day, a tradition started by Arthur Fiedler of the Boston Pops in 1974. The hard rock band AC/DC also used cannon in their song "For Those About to Rock (We Salute You)", and in live shows replica Napoleonic cannon and pyrotechnics were used to perform the piece. Cannons recovered from the sea are often extensively damaged from exposure to salt water; because of this, electrolytic reduction treatment is required to forestall the process of corrosion. The cannon is then washed in deionized water to remove the electrolyte, and is treated in tannic acid, which prevents further rust and gives the metal a bluish-black colour. After this process, cannon on display may be protected from oxygen and moisture by a wax sealant. A coat of polyurethane may also be painted over the wax sealant, to prevent the wax-coated cannon from attracting dust in outdoor displays. In 2011, archaeologists say six cannon recovered from a river in Panama that could have belonged to legendary pirate Henry Morgan are being studied and could eventually be displayed after going through a restoration process. ^ a b c Lu 1988. ^ Andrade 2016, p. 330. ^ Chase 2003, p. 32. ^ Needham 1986, p. 293. ^ a b c Kelly 2004, p. 29. ^ a b c d e Andrade 2016, p. 76. ^ Khan 2004, p. 9-10. ^ a b Korean Broadcasting System-News department (2005-04-30). "Science in Korea". Countdown Begins for Launch of South Korea’s Space Rocket. Korean Broadcasting System. Retrieved 2006-07-27. ^ a b Chase 2003, p. 173. ^ a b Tran 2006, p. 75. ^ a b c d Andrade 2016, p. 75. ^ Chase 2003, p. 59. ^ Needham 1986, p. 51. ^ Kelly 2004, p. 66. ^ Andrade 2016, p. 103-104. ^ Black, Jeremy A.; George, Andrew; Postgate, J. N. (2000). A Concise Dictionary of Akkadian. Otto Harrassowitz Verlag. ISBN 978-3-447-04264-2. ^ a b "Definition and etymology of "cannon"". Webster's Dictionary. Retrieved 26 May 2008. ^ "Etymology of "Cane"". Online Etymology Dictionary. Retrieved 26 May 2008. ^ "Definition and etymology of "cane"". Webster's Dictionary. Retrieved 26 May 2008. ^ "Definition of cannon". Cambridge Advanced Learner's Dictionary. Retrieved 30 October 2014. ^ Needham 1986, p. 263-275. ^ Crosby 2002, p. 99. ^ Chase 2003, p. 31-32. ^ Andrade 2016, p. 52-53. ^ Needham 1986, p. 293-4. ^ Andrade 2016, p. 329. ^ Needham 1986, p. 10. ^ Arnold 2001, p. 18. ^ Andrade 2016, p. 54. ^ Norris, John (2003). Early Gunpowder Artillery: 1300–1600. Marlborough: The Crowood Press. p. 11. ISBN 978-1-86126-615-6. ^ Andrade 2016, p. 66. ^ R. G. Grant (2005). Battle: a visual journey through 5,000 years of combat (illustrated ed.). DK Pub. p. 99. ISBN 978-0-7566-1360-0. ^ Chase, Kenneth Warren (2003). Firearms: A Global History to 1700. Cambridge University Press. ISBN 978-0-521-82274-9. Little is known about their armament, but Chinese ships did carry bronze cannon at this time, as evidenced by the wreck of a small two-masted patrol vessel discovered in Shandong together with its anchor (inscribed 1372) and cannon (inscribed 1377). ^ Chase, Kenneth Warren (2003). Firearms: A Global History to 1700. Cambridge University Press. ISBN 978-0-521-82274-9. Considering that Chinese ships armed with gunpowder weapons, including cannon, visited the region regularly from the 1200s to the 1400s. ^ Xiaodong 2008, p. 41-61. ^ Needham 1986, p. 430. ^ Archer, Christon I. (2002). World History of Warfare. University of Nebraska Press. p. 211. ISBN 978-0-8032-4423-8. Retrieved 26 May 2008. ^ Derrick Grose. "Admiral Yi Sun-shin and Turtle Ships". "Virtual stamp Collection". Grose Educational Media, 2011. Archived from the original on 21 January 2012. Retrieved 22 September 2011. ^ Dmytryshyn 1985, p. 90. ^ Joseph Needham; Gwei-Djen Lu; Ling Wang (1987). Science and civilisation in China, Volume 5, Part 7. Cambridge University Press. pp. 48–50. ISBN 978-0-521-30358-3. ^ Joseph Needham; Gwei-Djen Lu; Ling Wang (1987). Science and civilisation in China, Volume 5, Part 7. Cambridge University Press. p. 358. ISBN 978-0-521-30358-3. ^ Bert S. Hall, "Introduction, 1999" p. xxiv to the reprinting of James Riddick Partington (1960). A history of Greek fire and gunpowder. JHU Press. ISBN 978-0-8018-5954-0. ^ a b Andrade 2016, p. 334. ^ Andrade 2016, pp. 76, 335. ^ Crosby 2002, p. 120. ^ a b c Nicolle, David (2000). Crécy 1346: Triumph of the Longbow. Osprey Publishing. p. 21. ISBN 978-1-85532-966-9. ^ a b c d e f g h i j Andrade, Tonio (2016). The Gunpowder Age China, Military Innovation, and the Rise of the West in World History. Princeton University Press. ISBN 9781400874446. ^ a b c Hassan, Ahmad Y. "Gunpowder Composition for Rockets and Cannon in Arabic Military Treatises in Thirteenth and Fourteenth Centuries". Ahmad Y Hassan. Archived from the original on 26 February 2008. Retrieved 8 June 2008. ^ Hassan, Ahmad Y. "Technology Transfer in the Chemical Industries". Ahmad Y Hassan. Archived from the original on 27 April 2007. Retrieved 17 February 2007. ^ Khan, Iqtidar Alam (1996). "Coming of Gunpowder to the Islamic World and North India: Spotlight on the Role of the Mongols". Journal of Asian History. 30: 41–5. .
^ Khan, Iqtidar Alam (2004). "Gunpowder and Firearms: Warfare in Medieval India". Oxford University Press. .
^ Needham 1986, p. 44. ^ a b c d Ágoston 2005, p. 15. ^ Purton 2010, p. 108-109. ^ Needham 1986, p. 47. ^ a b Bradbury 1992, p. 293. ^ a b Ágoston, Gábor (2014). "Firearms and Military Adaptation: The Ottomans and the European Military Revolution, 1450–1800". Journal of World History. 25 (1): 85–124. doi:10.1353/jwh.2014.0005. ISSN 1527-8050. ^ Gat, Azar (2006). War in Human Civilization. New York City: Oxford University Press. p. 461. ISBN 978-0-19-926213-7. ^ Bag, A. K. (2005). "Fathullah Shirazi: Cannon, Multi-barrel Gun and Yarghu". Indian Journal of History of Science: 431–436. ^ Khan, Iqtidar Alam (1999). "Nature of Gunpowder Artillery in India during the Sixteenth Century: A Reappraisal of the Impact of European Gunnery". Journal of the Royal Asiatic Society. 9 (1): 27–34. doi:10.1017/S1356186300015911. JSTOR 25183626. ^ a b Nourbakhsh, Mohammad Reza (Farhad) (2008). "Iran's Early Encounter with Three Medieval European Inventions (875-1153 AH/1470-1740 CE)". Iranian Studies. 41 (4): 549–558. doi:10.1080/00210860802246242. JSTOR 25597489. ^ KHAN, IQTIDAR ALAM (1995). "FIREARMS IN CENTRAL ASIA AND IRAN DURING THE FIFTEENTH CENTURY AND THE ORIGINS AND NATURE OF FIREARMS BROUGHT BY BABUR". Proceedings of the Indian History Congress. 56: 435–446. JSTOR 44158646. ^ Nossov, Konstantin (2007). Medieval Russian Fortresses AD 862–1480. Osprey Publishing. p. 52. ISBN 978-1-84603-093-2. ^ Geoffrey Alan Hosking (2001). Russia and the Russians: A History. Harvard University Press. p. 91. ISBN 9780674004733. ^ a b c d Turnbull, Stephan (2004). The Walls of Constantinople AD 413–1453. Osprey Publishing. pp. 39–41. ISBN 978-1-84176-759-8. ^ Wallechinsky, David; Irving Wallace (1975). The People's Almanac. Doubleday. ISBN 978-0-385-04186-7. ^ Eaton, Richard M.; Wagoner, Philip B. (2014). "Warfare on the Deccan Plateau, 1450–1600: A Military Revolution in Early Modern India?". Journal of World History. 25 (1): 5–50. doi:10.1353/jwh.2014.0004. ISSN 1527-8050. ^ Cassidy, Ben (2003). "Machiavelli and the Ideology of the Offensive: Gunpowder Weapons in The Art of War". The Journal of Military History. 67 (2): 381–404. doi:10.1353/jmh.2003.0106. ISSN 1543-7795. ^ Khan, Iqtidar Alam (2005). "Gunpowder and Empire: Indian Case". Social Scientist. 33 (3/4): 54–65. JSTOR 3518112. ^ Paul, Michael C. (2004). "The Military Revolution in Russia, 1550-1682". The Journal of Military History. 68 (1): 9–45. doi:10.1353/jmh.2003.0401. ISSN 1543-7795. ^ Nourbakhsh, Mohammad Reza (Farhad) (2008). "Iran's Early Encounter with Three Medieval European Inventions (875-1153 AH/1470-1740 CE)". Iranian Studies. 41 (4): 549–558. doi:10.1080/00210860802246242. JSTOR 25597489. ^ Krebs, Robert E. (2004). Groundbreaking Scientific Experiments, Inventions, and Discoveries of the Middle Ages and the Renaissance. Greenwood Publishing Group. p. 270. ISBN 978-0-313-32433-8. ^ Tunis, Edwin (1999). Weapons: A Pictorial History. Baltimore, Maryland: Johns Hopkins University Press. p. 89. ISBN 978-0-8018-6229-8. ^ översättning och bearbetning: Folke Günther ... (1996). Guinness Rekordbok (in Swedish). Stockholm: Forum. p. 204. ISBN 978-91-37-10723-3. ^ Nossov, Konstantin (2006). Russian Fortresses, 1480–1682. Osprey Publishing. pp. 53–55. ISBN 978-1-84176-916-5. ^ a b Machiavelli, Niccolò (2005). The Art of War. Chicago, Ill.: University of Chicago Press. p. 74. ISBN 978-0-226-50046-1. ^ a b c Wilkinson, Philip (9 September 1997). Castles. Dorling Kindersley. p. 81. ISBN 978-0-7894-2047-3. ^ Chartrand, René (2006). Spanish Main: 1492–1800. Osprey Publishing. ISBN 978-1-84603-005-5. ^ Sadler, John (2006). Flodden 1513: Scotland's Greatest Defeat. Osprey Publishing. pp. 22–23. ISBN 978-1-84176-959-2. ^ "Encyclopædia Britannica Online – Mortar". Retrieved 13 March 2008. ^ Jones, Archer (2001). The Art of War in the Western World. New York City: University of Illinois Press. p. 235. ISBN 978-0-252-06966-6. ^ Hodgkin, John (1902). Rarioria, vol. III; "Books on Fireworks". Sampson Low, Marston & Company, Limited. p. 15. ^ Malthus (1629). A Treatise on Artificial Fire-Works. W. Jones for Richard Hawkins. ^ a b Griffith, Paddy (2006). 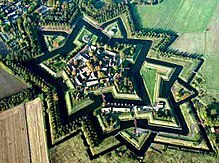 The Vauban Fortifications of France. Osprey Publishing. p. 5. ISBN 978-1-84176-875-5. ^ Stone, George Cameron (1999). A Glossary of the Construction, Decoration, and Use of Arms and Armor in All Countries and in All Times. Courier Dover Publications. p. 162. ISBN 978-0-486-40726-5. ^ Heath, Byron (2005). Discovering the Great South Land. Kenthurst: Rosenberg Publishing. p. 127. ISBN 978-1-877058-31-8. ^ Knox, Dudley W. (1939). Naval Documents related to the United States Wars with the Barbary Powers, Volume I. Washington, D.C.: United States Government Printing Office. ^ a b Manigault, Edward; Warren Ripley (1996). Siege Train: The Journal of a Confederate Artilleryman in the Defense of Charleston. Charleston, South Carolina: University of South Carolina Press. p. 83. ISBN 978-1-57003-127-4. ^ "The Historical Maritime Society". The Historical Maritime Society. 2001. Archived from the original on 16 May 2008. Retrieved 26 May 2008. ^ Twelve-, 18-, 24-, 32-, and 42-pounders, but 6-pounder and 68-pounder versions are known. ^ Conner, Susan P. (2004). The Age of Napoleon. Greenwood Publishing Group. p. 12. ISBN 978-0-313-32014-9. Retrieved 26 May 2008. ^ Asprey, Robert B. (2000). The Rise of Napoleon Bonaparte. Basic Books. p. 111. ISBN 978-0-465-04881-6. Retrieved 26 May 2008. ^ a b Asprey, pp. 112–113. ^ a b Baynes, p. 669. ^ Nofi, Albert A. (1998). The Waterloo Campaign: June 1815. Da Capo Press. p. 123. ISBN 978-0-938289-98-2. Retrieved 26 May 2008. ^ Craik, George L.; Charles MacFarlane (1884). The Pictorial History of England During the Reign of George the Third: Being a History of the People, as well as a History of the Kingdom, volume 2. London: Charles Knight. p. 295. Retrieved 26 May 2008. ^ Chandler, David G. (1995). The Campaigns of Napoleon. New York City: Simon & Schuster. p. 582. ISBN 978-0-02-523660-8. ^ Adkin, Mark (2002). The Waterloo Companion. Stackpole Books. p. 283. ISBN 978-0-8117-1854-7. Retrieved 26 May 2008. ^ Wilkinson-Latham, Robert (1975). Napoleon's Artillery. France: Osprey Publishing. p. 32. ISBN 978-0-85045-247-1. Retrieved 26 May 2008. ^ "Carronade". The Historical Maritime Society. Archived from the original on 2 January 2008. Retrieved 6 March 2008. ^ Hazlett, James C.; Edwin Olmstead; M. Hume Parks (2004). Field Artillery Weapons of the American Civil War (5th ed.). Champaign, Illinois: University of Illinois Press. pp. 88–108. ISBN 978-0-252-07210-9. ^ Dickens, Charles (22 April 1859). "All the Year Round: A Weekly Journal". Charles Dickens: 373. Retrieved 26 May 2008. ^ Bastable, Marshall J. (2004). Arms and the State: Sir William Armstrong and the Remaking of British Naval Power, 1854–1914. Ashgate Publishing, Ltd. p. 59. ISBN 978-0-7546-3404-1. Retrieved 26 May 2008. ^ Ruffell, W. L. "The Gun – Rifled Ordnance: Whitworth". The Gun. Archived from the original on 13 February 2008. Retrieved 6 February 2008. ^ Bastable, Marshall J. (2004). Arms and the State: Sir William Armstrong and the Remaking of British Naval Power, 1854–1914. Ashgate Publishing, Ltd. p. 94. ISBN 978-0-7546-3404-1. Retrieved 26 May 2008. ^ Young, Mark C. (2002). Guinness Book of World Records, 2002 edition. Bantam Books. p. 112. ISBN 978-0-553-58378-6. ^ (in French) "De Buonaparte et des Bourbons" – full text in the French Wikisource. ^ Shakespeare, William (1598). Henry IV, Part 1. Part 1, act 4, sc. 2, l. 65-7. ^ "Nuclear artillery". United States Department of Energy. Archived from the original on 7 May 2008. Retrieved 26 May 2008. ^ AAP-6 NATO Glossary of Terms and Definitions (PDF). North Atlantic Treaty Organization. 2007. p. 113. Retrieved 26 May 2008. ^ a b "Definition of "Gun"". Merriam-Webster's Dictionary. Retrieved 26 May 2008. ^ "Definition of "Howitzer"". Merriam-Webster's Dictionary. Retrieved 26 May 2008. ^ "Definition of "Mortar"". Merriam-Webster's Dictionary. Retrieved 26 May 2008. ^ Gudmundsson, Bruce I. (1993). On Artillery. Greenwood Publishing Group. p. 43. ISBN 978-0-275-94047-8. ^ McCamley, Nicholas J. (2004). Disasters Underground. Pen & Sword Military. ISBN 978-1-84415-022-9. ^ "Radio Proximity (VT) Fuzes". 20 March 2000. Archived from the original on 9 February 2014. Retrieved 26 May 2008. ^ "Variable Time Fuse Contributed to the Victory of United Nations". Smithsonian Institution. 2007. Retrieved 5 October 2007. ^ Keegan, John (2000). World War II: A Visual Encyclopedia. Sterling Publishing Company, Inc. p. 29. ISBN 978-1-85585-878-7. ^ Rahman, Jason (November 2007). "British Anti-Tank Guns". Avalanche Press. Retrieved 26 May 2008. ^ a b Green, Michael; Thomas Anderson; Frank Schulz (2000). German Tanks of World War II in Color. Zenith Imprint. p. 46. ISBN 978-0-7603-0671-0. Retrieved 26 May 2008. ^ Zetterling, Niklas; Anders Frankson (2000). Kursk 1943: A Statistical Analysis. Routledge. p. 63. ISBN 978-0-7146-5052-4. ^ Bradford, George (2007). German Early War Armored Fighting Vehicles. Mechanicsburg, Pennsylvania: Stackpole Books. p. 3. ISBN 978-0-8117-3341-0. ^ Playfair, Ian S. O.; T. P. Gleave (1987). The Mediterranean and Middle East. HMSO. p. 257. ISBN 978-0-11-630946-4. ^ McCarthy, Peter; Mike Syron (2003). Panzerkrieg: The Rise and Fall of Hitler's Tank Divisions. Carroll & Graf Publishers. p. 239. ISBN 978-0-7867-1264-9. Retrieved 26 May 2008. ^ Jarymowycz, Roman Johann (2001). Tank Tactics: From Normandy to Lorraine. Lynne Rienner Publishers. p. 115. ISBN 978-1-55587-950-1. Retrieved 26 May 2008. ^ Russ, Martin (1999). Breakout: The Chosin Reservoir Campaign, Korea 1950. Penguin Books. pp. 383–384. ISBN 978-0-14-029259-6. ^ "M198 information". Military.com. Archived from the original on 5 June 2008. Retrieved 26 May 2008. ^ a b "Affordable precision". National Defense Magazine. Archived from the original on 8 October 2006. Retrieved 26 May 2008. ^ Pike, John (18 February 2008). "DDG-1000 Zumwalt / DD(X) Multi-Mission Surface Combatant". Global Security. Retrieved 26 May 2008. ^ "Raytheon Company: Products & Services: Advanced Gun System (AGS)". Raytheon, Inc. Archived from the original on 19 March 2008. Retrieved 26 May 2008. ^ a b Williams, Anthony G. (2000). Rapid Fire. Shrewsbury: Airlife Publishing Ltd. p. 241. ISBN 978-1-84037-435-3. ^ "Cannon Definition". Merriam Webster Dictionary. Merriam Webster. Retrieved 17 September 2011. ^ a b c d Dr. Carlo Kopp. "Aircraft cannon". Strike Publications. Retrieved 26 May 2008. ^ Woodman, Harry (1989). Early Aircraft Armament – The Aircraft and the Gun up to 1918. Arms and Armour Press. ISBN 978-0-85368-990-4. ^ "GAU-8/A". 442nd Fighter Wing. Archived from the original on 19 July 2011. Retrieved 26 May 2008. ^ "Information on the GAU-8/A". The Language of Weaponry. Archived from the original on 19 June 2009. Retrieved 26 May 2008. ^ a b c Kingsbury, Charles P. (1849). An elementary treatise on artillery and infantry. New York: GP Putnam. OCLC 761213440. ^ Hogg, Ian V.; John H. Batchelor (1978). Naval Gun. Blandford Press. ISBN 978-0-7137-0905-6. ^ Baynes, Thomas S. (1888). The Encyclopædia Britannica A Dictionary of Arts, Sciences, Literature and General Information, volume 2. H.G. Allen. p. 667. Retrieved 26 May 2008. ^ a b "Gunnery". Encyclopædia Britannica. Edinburgh: Encyclopædia Britannica, Inc. 1771. ^ Holmes, Richard (2002). Redcoat: the British Soldier in the age of Horse and Musket. W. W. Norton & Company. ISBN 978-0-393-05211-4. ^ Griffiths, The Artillerist's Manual, 53. ^ "December of 1780". National Park Service. Retrieved 26 May 2008. ^ "Definitions of Civil War terms". www.civilwarhome.com/. Retrieved 27 May 2008. ^ Lampson, Dave. ""1812" Overture in E Flat Major Op. 49 (1880)". Classical Net. Archived from the original on 28 August 2007. Retrieved 26 May 2008. ^ a b c Druckenbrod, Andrew (4 August 2003). "How a rousing Russian tune took over our July 4th". Pittsburgh Post-Gazette. Retrieved 26 May 2008. ^ Lee, Ernest Markham (1906). Tchaikovsky. Harvard University: G. Bell & sons. p. 21. Retrieved 26 May 2008. ^ Flynn, Tony. "Antal Dorati – Recording Legend – October 2007". Retrieved 26 May 2008. ^ "Classical Net – Tchaikovsky – 1812 Overture". Archived from the original on 28 August 2007. Retrieved 26 May 2008. ^ a b "For Those About to Rock We Salute You". AllMusic. Retrieved 26 May 2008. ^ Welss, Carmen. "Rescue Project "Endeavour Cannon"". Foundation for National Parks & Wildlife. Archived from the original on 20 July 2008. Retrieved 26 May 2008. ^ "Preserving My Heritage – Before & After Gallery – Cannon". Canadian Conservation Institute. Archived from the original on 29 March 2005. Retrieved 26 May 2008. ^ a b "Civil War Union Cannon Conservation, CRL Report 5". Archived from the original on 1 January 2005. Retrieved 26 May 2008. This article incorporates text from the 1771 Encyclopædia Britannica, which is in the public domain. Andrade, Tonio (2016), The Gunpowder Age: China, Military Innovation, and the Rise of the West in World History, Princeton University Press, ISBN 978-0-691-13597-7 . Brown, G. I. (1998), The Big Bang: A History of Explosives, Sutton Publishing, ISBN 978-0-7509-1878-7 . Chase, Kenneth (2003), Firearms: A Global History to 1700, Cambridge University Press, ISBN 978-0-521-82274-9 . Cowley, Robert (1993), Experience of War, Laurel . Crosby, Alfred W. (2002), Throwing Fire: Projectile Technology Through History, Cambridge University Press, ISBN 978-0-521-79158-8 . Curtis, W. S. (2014), Long Range Shooting: A Historical Perspective, WeldenOwen . Dickens, Charles (22 April 1859). "All the Year Round: A Weekly Journal". Donagan, Barbara (2008). War in England 1642–1649. Oxford: Oxford University Press. ISBN 978-0-19-928518-1. Earl, Brian (1978), Cornish Explosives, Cornwall: The Trevithick Society, ISBN 978-0-904040-13-5 . Grant, R.G. (2011), Battle at Sea: 3,000 Years of Naval Warfare, DK Publishing . Hadden, R. Lee. 2005. "Confederate Boys and Peter Monkeys." Armchair General. January 2005. Adapted from a talk given to the Geological Society of America on March 25, 2004.
al-Hassan, Ahmad Y. (2001), "Potassium Nitrate in Arabic and Latin Sources", History of Science and Technology in Islam, retrieved 23 July 2007 . Hobson, John M. (2004), The Eastern Origins of Western Civilisation, Cambridge University Press . Johnson, Norman Gardner. "explosive". Encyclopædia Britannica. Chicago: Encyclopædia Britannica Online. Kelly, Jack (2004), Gunpowder: Alchemy, Bombards, & Pyrotechnics: The History of the Explosive that Changed the World, Basic Books, ISBN 978-0-465-03718-6 . Khan, Iqtidar Alam (1996), "Coming of Gunpowder to the Islamic World and North India: Spotlight on the Role of the Mongols", Journal of Asian History, 30: 41–5 . Konstam, Angus (2002), Renaissance War Galley 1470–1590, Osprey Publisher Ltd. .
McNeill, William Hardy (1992), The Rise of the West: A History of the Human Community, University of Chicago Press . Needham, Joseph (1986), Science & Civilisation in China, V:7: The Gunpowder Epic, Cambridge University Press, ISBN 978-0-521-30358-3 . Norris, John (2003), Early Gunpowder Artillery: 1300–1600, Marlborough: The Crowood Press . Partington, J. R. (1960), A History of Greek Fire and Gunpowder, Cambridge, UK: W. Heffer & Sons . Patrick, John Merton (1961), Artillery and warfare during the thirteenth and fourteenth centuries, Utah State University Press . Pauly, Roger (2004), Firearms: The Life Story of a Technology, Greenwood Publishing Group . Petzal, David E. (2014), The Total Gun Manual (Canadian edition), WeldonOwen . Tran, Nhung Tuyet (2006), Viêt Nam Borderless Histories, University of Wisconsin Press . Willbanks, James H. (2004), Machine guns: an illustrated history of their impact, ABC-CLIO, Inc.
Wikimedia Commons has media related to Cannons. Look up cannon in Wiktionary, the free dictionary. This page was last edited on 14 April 2019, at 17:11 (UTC).